From my research and reading what others have written on this site there are currently three mid to large size studies that have demonstrated the benefits (or non-inferiority) of using an accelerated non-operative rehabilitation protocol. I have summarized the results of the studies below. Disclaimer: This is my interpretation of the papers and is obviously a simplification of the results and protocols. I encourage everyone to do their own research. Also, at this point the Exeter study seems to have only published an abstract so there’s not a lot of detailed information on their results. Finally, below is the protocol given to me by my physiotherapist. understand why in your post you quote 4 weeks as FWB whereas it can begin after 2 weeks in the Exeter rehab protocol. The abstract lists the ortho surgeons involved. You could write to them asking for the full study. I don’t know if some of the report may be redacted but would still be of interest I’m sure. C, I’m pretty sure the image you show is the exact same page the UWO authors faxed to my fancy sports-med OS after he attended their presentation at AAOS2009 - except for the handwritten edits to postpone the NWB–>PWB transition. Especially since early PWB starts with 0% weight and proceeds gradually as tolerated - often slowed more by fear than discomfort or pain - I wonder how your Doc justifies the deviation. BTW, if you carefully compare the published (2010) UWO protocol with this faxed version or bit.ly/UWOProtocol, which I transcribed from my copy, there are a couple of differences which I believe are errors in the published version(!). I recall the removal of the heel wedges at 2 weeks in (vs. 6), which seems wrong to me, my OS, AND the one UWO-Study author who responded to my email (details on my blog - somewhere!). One simple thing: the clock starts when your treatment starts, i.e. when you’re immobilized NWB in equinus. “Forget” the date of the injury. I’m being managed primarily by a physiotherapist (referred by my OS) and he was the one who changed the NWB -> PWB date. He didn’t really give any justification but I didn’t question it at the time. I might quiz him when I go in for my first appointment. Maybe doing PWB at 3 weeks and FWB starting at 4 is like taking the average of the UWO and Belfast protocols. Belfast had a lower rerupture rate that UWO so perhaps there is some justification there? In any case, I’m currently in week 3 and have started doing a little bit of PWB (just 20 light steps with both crutches so far) because I feel the need to make some sort of active progress towards recovery! The online protocol for UWO (not linked because you need a journal subscription - which I luckily have through my university) does list removal of heel wedges at 6 weeks so perhaps they’ve corrected any previous errata. I think UWO is the only one of the three that randomized the patients for -op vs. non-op. Exeter may have divided theirs primarily based on “informed consent”, and Belfast treated everybody non-op — including reruptures and “stale” ATRs! — UNLESS their torn AT ends could not be approximated by immobilization in equinus, as diagnosed by the senior author. In a way, the Belfast study is (IMO) the most impressive of the three, because it seems to nail the key question in ATR care: “Is there actually a benefit from surgical repair, or not?” By customizing the equinus angle of the initial cast (based on observation and palpation) in a very large number of patients, the authors achieved a near-zero rerupture rate and claim a 99.4% return to pre-rupture sporting activity, with the other 0.6% “healing long” and receiving surgery. Of 96 patients with “stale” ATRs, 70 could be approximated and were treated non-op with clinical results identical to (or a smidge better than!) the prompt ATRs(!). The small # of reruptures were all(!) treated non-op, with 100% success. These results seem pretty brilliant to me, and with a total of 975 patients, nobody can claim that the results lack statistical power, or represent a fluke. OTOH, there is no quantification of post-rehab strength to compare to the numbers for post-op patients in UWO and a few other studies. I.e., it’s still possible that all these happy non-op patients returning to their pre-ATR activities had a slight strength deficit, slightly larger than other, post-op patients. This study is also interesting because (unlike UWO, which divided patients randomly then treated them all identically) it honors the “We’re all different” principle by (a) adjusting the initial ankle angle so it approximates the torn AT ends and (b) sending all patients whose torn ends canNOT be approximated to surgery. As fond as I am of the demonstrated “road map” of UWO, this slightly more customized approach seems very smart — though dependent on a health professional who is as good at this as Dr. Wallace, the chief author. But isn’t it an embarrassment to all the fancy specialist OSs out there, that Wallace seems to be the only Dr. in the world who can do this simple and obviously needed diagnosis?!? Surgery is still the norm in the US, but has lost big ground elsewhere, as the evidence from accelerated non-op studies proliferates and filters through to the surgeons (and directly to patients, too, through this site & YouTube). Like Canada, UK is erratic by location and individual surgeon/ consultant. The only ends he couldn’t bring together were a minority of the ~90 “stale” ATRs he treated. That minority of a minority (plus a tiny minority of the non-ops that healed long - which happens to some, both non-op and post-op) got sent for surgery. He reports a delightfully low rerupture rate (2.8%), and all of those healed fine non-op the second time. He also reports that ALL of his 975 patients who did sports returned to them, and a very high overall satisfaction rate, too. The full report is available free online. Everything else you were told is Evidence Based Medicine - though a lot of it is still “fighting words” in the States, for various reasons. Hi janecourt, I’m nearly 4 weeks into my non-op protocol and so far I’m very happy with my decision not to have surgery. The doctor I saw in emergency told me I’d probably need surgery but the orthopaedic surgeon I saw advised against it. Since UWO is <100km away from here (and one of the closest medical schools) perhaps it’s not surprising that non-op is the norm at my hospital. Incidentally, I have a colleague who went non-op in the late 1990’s and has had a full recovery. In fact he no longer remembers which leg he injured! Good luck with whatever decision you make! I initially went the non-op route six weeks ago, but then did end up getting surgery three weeks ago, but only after seeing that the gap between my severed tendon was 5cm. If my gap had been 4mm there is no way I would have gotten surgery. And in light of new evidence that Norm has passed on with numerous and various papers he has read I would prefer the non-op route for another 5cm gap (if it happens again) as long as I could get somebody in my area to help me with the fast non-op protocol and if they could approximate the ends, as Norm writes. The surgery was MUCH more of a pain than the initial non-surgical route I was embarking on. And it had various other unpleasant side effects or changes I had to make in my daily living. I mostly write about the good sides to my surgical outcome (so far) in my blog because I am being religious about recovery protocol and diet, but going under the knife is the last thing I want to do again if I can avoid it. The only caveat I can think of to my advice– I had read somewhere that Ultrasound does not always produce as clear picture, and that is why some prefer MRI scans. But then paradoxically my first Orthopedic surgeon advised against any scanning, neither the ultrasound nor the MRI scan, until I made the decision to go non-op. Then she had me do an MRI scan to make sure she was aligning the tendon and that the gap was not too big, or something like that. So I dunno, maybe scanning is overrated. Cecilia, I think the ATR “forgetting curve” - the gradual process of moving from thinking about our ATR ALL the time, to occasionally forgetting about it for a few minutes, then longer and longer - is one of the best mental indicators of recovery, IMHO. Another one is having another leg problem - preferably affecting the OTHER leg - that bothers you more than the ATR. Jon (Goldman), I’ve had shockingly disappointing results with both, MRIs and USs - though theMRIs were of my Dad’s spine, not my leg. In fact, there are now several studies showing terrible results of MRIs of the spine. One study gave MRIs to a number of individuals who had great backs, no problem at all, and the scans showed serious problems in most (or at least many). Another study randomized a group of patients with chronic back pain. All got MRIs. Half got the results, images and explanation, and the other half were “forgotten”. On followup, the forgotten group had significantly better outcomes! My impression is that an X-ray is probably warranted, because it’s cheap and harmless and will spot some rare avulsions, but that MRIs and USs don’t actually add much besides delay and expense to ATR diagnosis. Wallace skipped them both in his recent huge study, and his results are about as good as they get. BTW, the most famous back expert here in ON says that, apart from pre-op, there’s only one indication for an MRI of the spine, and that’s to worry your worst enemy! My Dad’s MRIs could easily have killed him, details on my blog. Reading both kinds of scans seems to be more art than science, which wouldn’t be so bad if they didn’t have a glowing aura of objective science. In case you’ve arrived here by mistake, and you are not an AT sufferer, but do have 10/10 stabbing pain in your back and legs, take the MRI scan offered, soon. Could be a disk problem, could be a tumor. Personally I would not want to make a mistake when the technology is there to facilitate informed decisions before it is too late. Would agree that Norman’s experiences show the flip side of the tech stuff which should be used in conjunction with the symptoms, blood tests, and so on that you should get. Hello, obviously my reply above didn’t refer to you. More for someone who maybe Googled ‘pain in the back’ and found the blog. Jane, we haven’t had an MD self-identify here for a long time, if ever. I wish! We’ve had a few ATR patients who were MDs in other fields, and most understandably chose to lie low. In the early days of this site, before my time, there was a PT who contributed a lot. I think it will come, as we move forward toward patient-centered medicine. I just had an experience yesterday, proving once again that we’re not there yet. I’ve had a heart valve replaced, and I’ve been taking antibiotics before I get my teeth cleaned. Not my fave, and the evidence of benefit - to avoid endocarditis, which is scary for me - is virtually non-existent. One of these logical sounding prescriptions with no scientific support. The consensus recommendatiins keep slowly backing away from the drugs. A few years ago when I was pre-op, I was supposed to take the pills, then they decided I shoukd stop. Then I had the op, and I had to start again. Norm– I hear ya on the imaging concerns, but resonate with Donna’s sentiments. I personally had a good experience with the MRI and my ATR. My #2 surgeon who did the actual procedure confirmed what the MRI from surgeon #1 reported. Area of country and general skill of medical community could play in here too. I mean, the Boston area has 1 million physicians (OK, a little exaggerating but there are a lot of hospitals, clinics, and private practices around these parts). So maybe the overall bar is higher, more skill set and experience to draw on? Ron, my own personal Just Completely Wrong MRI experience concerns three consecutive monthly spinal MRIs my then-93-ish Dad had in (or in the lab next to?) Hyannis Hospital on Cape Cod, MA. At least at the time, it was more highly rated on many scales than many of the Boston hospitals (and we found BI really awful when he was there!). Our experience in that Hyannis Hospital was consistently excellent, except that these three MRIs were completely fallacious, in magnitude and even in sign! He had checked into the first hospital (maybe Hyannis, maybe not, I forget) with miserable back pain, virtually the first of his life anything like that bad. So they sent him for blood tests and a spinal MRI. The MRI folks and about half of the other experts said the only responsible choice was to rush him under the knife to excise the infection before it spread to his spinal cord and paralized or killed him. His GP and a few others and most of his family weren’t sure that sounded like a good idea given everything. So we continued the massive IV antibiotics and scheduled another MRI in a month. That second MRI showed that the shadow had gotten bigger and darker, and he insistency of the “pro-op MRI-trusters” was greater than before. The rest of us resisted again, with great trepidation — but buoyed by the fact that Dad’s clinical condition had not deteriorated. Another month of the same. Two months after the first MRI, Dad went for a third, which showed again that the shadow had gotten even bigger and darker than in the second MRI. But by then, Dad’s backache had just about disappeared! It went away completely soon afterwards, and he checked out of the hospital and went back home, and soon into an Assisted Living place, where he lived remarkably well — and with no backaches at all! — until he faded fast and died at 98. Thank God we didn’t trust the MRI people! BTW, I’ve noticed a slight and “harmless unless it means something” arrythmia in my resting heartbeat recently, and I just got a cardiac MRI this evening as part of the attempt to figure out if it means something. So I haven’t given up on imaging — or even MRIs — completely! But if the MRI tech tries to convince my Cardiologist that I died a year ago, I’m going to be skeptical! LOL. Funny Norm, at least I hope you meant it to be humorous. A couple observations: I googled “massachusetts top hospitals,” and the Hyannis hospital was not in the top 13 in the health.usnews.com list, for what that is worth. 2nd: The Lahey Clinic, the place I go to, has their MRI machine schedule at 24/7 during the week and long hours on the weekend, so obviously it is a real cash cow for them. I’m just into week 5 non-op, in a walker boot though haven’t yet had any physio input, or been told I can go PWB yet. I’ve got another appointment with the Clinic tomorrow and I intend to present this info (assuming you don’t mind). Good luck with your next appointment James.. Definitely bring one of these protocols with you. It sounds like we injured ourselves around the same time so I look forward to reading more about your progress over the next few months! Cecilia, normofthenorth referred me to you post, thanks for the info, I ruptured my AT on 3/28, I just have to convince my dr that your info is an alternative to his current protocol and that I would like to try it. I’ve been in a cast for 4+ weeks and not schedule to go into a boot until week 6. I took a functional achilles test prior to my surgery on April 9th. While they still haven’t managed to send me the results, they did send me the a published article that use the same functional test, among other means, to assess the outcome of operative vs non-operative treatment. I haven’t read the study in full detail yet, but it looks like we have a fourth high quality study that we should perhaps include in posts like this one. Hi Tord, Thanks for the link! I’ve downloaded the paper and protocols and will try and add a summary and reference to the page in the next few days. 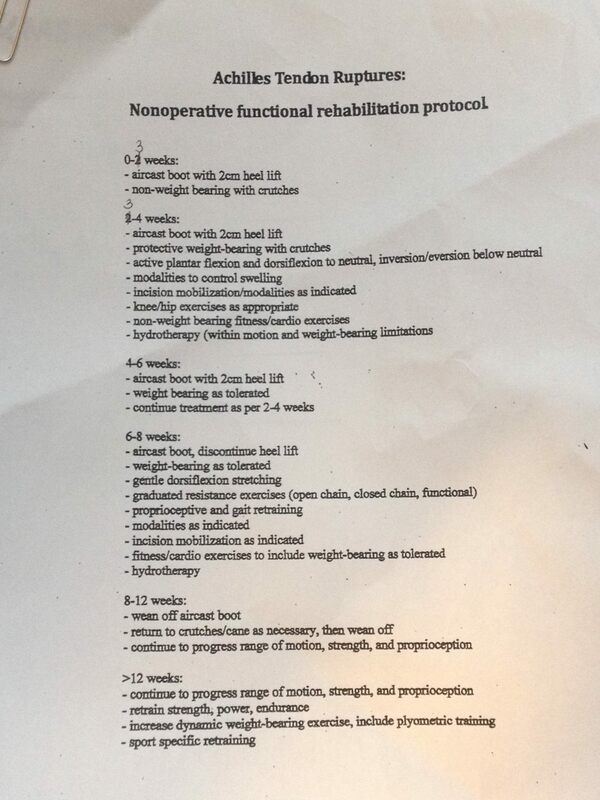 At first glance the non-op protocol looks very similar to Exeter: FWB at 2 weeks, Wean off boot at 8 weeks. It also specifies using heel lifts in shoes until 14 weeks and using a compression stocking. I’m another person referred here by Norm (thanks to both of you for all the information you have made available!). Injury Sunday 5/25 and seeing the doctor Friday (tomorrow AM) so doing preparatory research. My doctor seems to favor surgery, but that makes sense given his basis of comparison is the old-style non-op treatment. He seems open to talking about it. Such a useful blog to read thanks. I ruptured mine 27/05/14. So am in the early stages of recovery. Still have cast on but hopefully get a boot on Thursday. Have found your pages really useful. Good luck. I’ve just created the link bit.ly/3protocols to point back to this page. cecilia has completed the grueling 26.2 ATR miles to full recovery!